Aimee graduated from Brown University and received her medical training at Johns Hopkins University and the University of Pennsylvania. After earning her Master of Science in Nursing, Aimee was awarded board certification as an advanced family nurse practitioner. She furthered her medical experience when she served as a bilingual medical volunteer in Ecuador. Aimee spent nine years working in emergency departments, critical care and office settings in Pennsylvania before moving back to her home state of Colorado in 2012. Aimee is exceptionally qualified to take care of all your primary health care needs including physical exams, women’s health, chronic conditions (such as diabetes, high blood pressure and cholesterol) and acute medical problems. With a holistic approach to patient care that focuses on health promotion and illness prevention, she welcomes the opportunity to work with patients in a partnership. 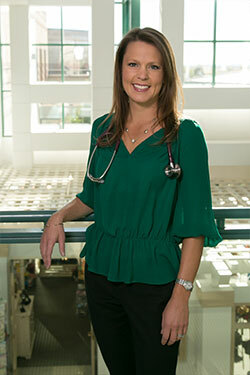 Aimee values shared goals for individualized, optimal health and improved quality of life. She brings an openness and energy to each patient encounter and is dedicated to supporting her patients in their health goals. Bright and friendly, Aimee is committed to, and thoroughly enjoys, her career caring for her patients. She is very focused on her role in providing the best healthcare possible to you. As an avid lover of the outdoors, Aimee stays active running, hiking, biking, skiing, and backpacking with her husband and young son and daughter.